SolidEssay provides custom essay writing and research services of the highest quality. Before submitting an order you should read our terms and conditions and make sure you fully understand this user agreement. By placing your order with SolidEssay you acknowledge and completely agree with all the conditions and authorize us to charge your credit card in the full amount of the cost of the services. By submitting an order/payment, you also agree that you are of legal age to purchase our custom writing services. Bear in mind that an unauthorized use of a stolen credit card is illegal and will be reported to the relevant law enforcement agencies. SolidEssay provides custom writing services and access to the database of sample papers. By submitting the order, you purchase a product for your personal, non-commercial use only. 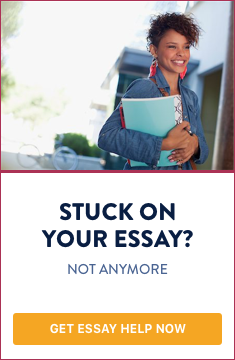 All essays, term papers, book reviews, case studies, theses, dissertations and other academic papers delivered to you are original, custom written. The full copyright is retained by SolidEssay. Your use of the delivered material is for your personal use only and shouldn't be distributed, published or sold without the prior coordination with us. Any unauthorized use of the delivered material may subject you to civil or criminal liability. You, as a customer, have a right to request a free revision of your custom written paper if you are not completely satisfied with it or have some remarks. The revision should be requested no later than within 14 days after the completion and delivery of your order. After this timeline we will assume that the paper meets all your requirements and you are completely satisfied. All revision requests will be declined. The original instructions of the assignment may not be changed to comply with our revision policy. If you are not completely satisfied with the delivered product or services you may request a refund. All refunds and cancellations should be clearly communicated and expressed to our Support Department. It is the sole discretion of Data Researchers Network to approve or disapprove your request for a refund on an individual case by case basis. By completing your order you acknowledge and agree that you have read and fully understand all terms and conditions. The products and services we provide are reference materials and are not intended to be submitted as completed works. They should be used as model papers and assist you in writing your own assignment. Any text and/or ideas that you borrow, reference, refer to from our paper must be properly cited and attributed to our website. We reserve the right to contact our customers by e-mail regarding new services, discounts, special offers and other useful information that the customer might be interested in.